In automotive terms, the HMI encompasses readouts and controls a driver and passenger use to operate different systems within the vehicle. The former smartphone giant of Waterloo, Ont. has been steadily expanding its footprint in the auto sector. It said the new platform allows simplified and seamless co-ordination of independent HMI products such as instrument readouts, audio controls and navigation systems. Currently different systems are linked through an internal bus and cabling that allow them to communicate with each other. Millions of vehicles already use software developed by Ottawa-based QNX, which BlackBerry acquired in 2010, to co-ordinate these systems. As independently designed electronic systems proliferate in vehicles it’s become increasingly difficult to integrate them so they don’t trip over each other. 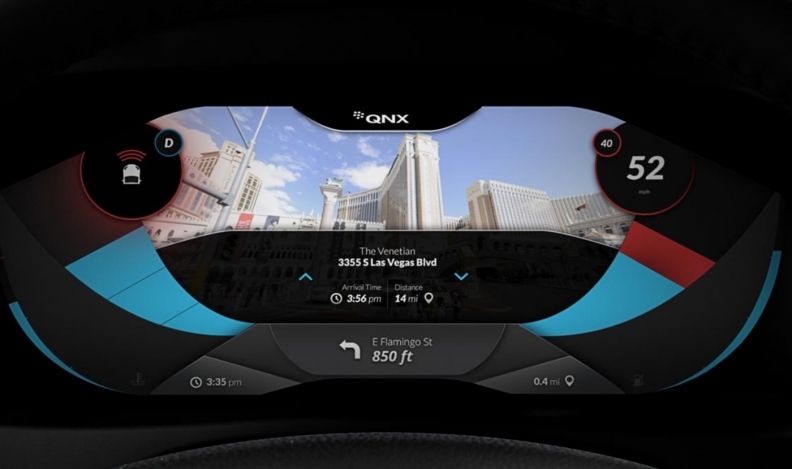 The new platform uses BlackBerry’s QNX Hypervisor and the Intel Atom processor A3900 series to do the work using just one electronic control unit. Hypervisor acts as a kind of computerized traffic cop, directing all the different electronic traffic generated while a car is in use. “The hypervisor’s job is to make sure one can not interfere with the other, one is totally secure from the other, totally isolated from the other except where they’re allowed to communicate,” Grant Courville, BlackBerry QNX senior automotive director, said in an interview with Automotive News Canada. The new platform presents a cost saving to automakers because it requires fewer parts and cable connections and should be easier to service. The consolidated system would also share information more easily. “All of a sudden, now automakers will be able to offer more functionality and systems that you may have found traditionally on the high-end or premium vehicles, they’ll be to offer some of that functionality to the more entry-level vehicles because of the cost reduction,” said Courville, stressing that’s up to each automaker’s product planners. The integrated platform offers designers fresh scope in laying out the cockpit, he said. The new platform will appear in car models scheduled for release after 2019. Courville would not say which models will feature it first.